What a wonderful thing it is to see Look@MyBaby being welcomed in the maternity hospitals of our northern neighbours though South East Asia. The culture and language is different, but one thing is universal when it comes to new babies. Sharing the joy with family and friends! This week we visited Jakarta and were introduced to Hospital CEOs and Clinical Teams praising the benefits of Look@MyBaby for their maternity wards. 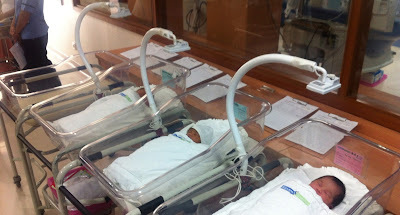 Our first hospital partners have finished their installations in Indonesia and with the help of our Customer Service Staff sitting in the hospitals every day to introduce the service, new babies are being beamed around the world - much to the delight of families all through SE Asia and beyond. Having spent a week with Look@MyBaby Asia Territory Manager, Shalini Krishnan, and spoken to so many parents and hospitals, it's easy to see why Look@MyBaby is being so well received. Asia is a thriving region with baby booming population growth. Hospitals there are in maternity overflow and so anything that can be used effectively as a tool to minimise visitors is going to be of great value. We already know that Look@MyBaby is the perfect alternative for family and friends having to visit hospitals in person in the hours and days after birth. Best practice infection control in maternity wards now includes Look@MyBaby as a means by which families can visit new babies without risk of accidentally spreading coughs and bugs. And in Jakarta where the traffic is a living beast, a seething mess of never-ending jams, hours long in every direction, a lot of time wasted to get from one part of the city to another; hospitals are offering Look@MyBaby as a means to remove the need to visit hospital. We have a new Facebook page now running for our Indonesia hospital partners. We invite you to follow us where you will see examples of the happy families we are helping: Facebook Look@MyBaby Indonesia.